Located near Hotel Conrad, opposite to Tata Management Training Centre, we found a charming homestay, Anand Guha, which was the former guest quarter of Maharaja of Bohor. The most enchanting thing about Anand Guha is of course, the master bedroom. 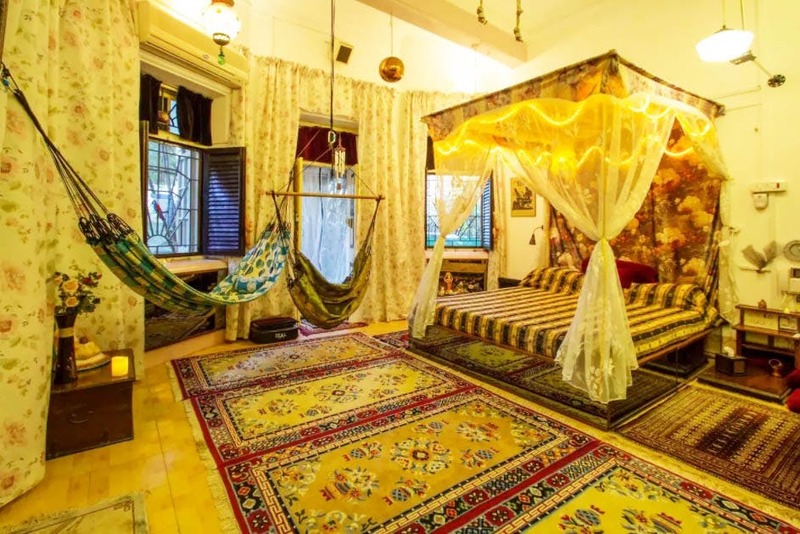 The space has a certain royal touch to it – the soft floral curtains, the king-size poster bed with lacy falls on all sides and fairy lights above, the wooden furniture with fancy artifacts, the long-and-broad golden framed mirror, the brass vases and the carpeted floors. What’s more? The two pretty hammocks inside the room that gives the ultimate comfy home vibe! You can cook your own meals at Anand Guha. There is a well-maintained modular kitchen, right next to the bathroom. The villa has air-conditioners and hot tub facilities. However, there is no television or WiFi! Loved the royal white bungalow? Book it here for a romantic getaway with the bae.